Take your kids to a great community-wide egg hunt, and snap a photo with the Easter Bunny! Nothing brings joy to children at the start of spring quite like the thrill of an Easter egg hunt, and lots of community groups are sponsoring egg hunts for kids of all ages across Long Island. 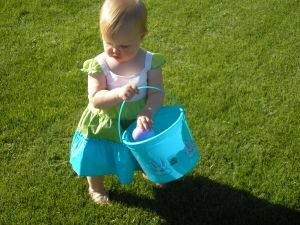 The playing field has been leveled at many of these events, and kids are now searching for eggs in age-appropriate groups. Be sure to bring your own basket, and to bring a camera to get cute photos, including an adorable picture with the Easter Bunny, who will be at many of the events listed. Here are some of the biggest egg hunts around Long Island. Belmont Lake State Park will host egg hunts every 15 minutes, starting at 12:15. Children will hunt in the following age groups: 4 and under, 5-6, and 7-9. The Easter Bunny will also be there, and kids can make environmental crafts and see animals at the petting zoo. This egg hunt is exclusively for kids in preschool through fourth grade, and includes special prize eggs, where prizes will be awarded to kids who find particular eggs. Have your picture taken with the Easter Bunny, enjoy good music and food, and go on an Easter egg hunt to win some prizes! Enjoy a delicious breakfast with the Easter Bunny, then go on an egg hunt, see a bonnet and basket parade, and even see a special planetarium show! Cost: $30 per adult, $18 per child. Time: 1 p.m. and 3 p.m.
Bring a basket and a camera to this egg hunt, where you can also take your child’s picture with the Easter Bunny, and enjoy live music and refreshments. Wear your Easter best and join the great egg hunt, which will be held on the lawn at Harborfront Park at 12:30 p.m., and is open to children ages 2-5 and 6-8. All children will receive a treat. All children are welcome to take part in this egg hunt. The rain date will be April 12. Subject: LongIsland.com - Your Name sent you Article details of "Join the Hunt: Top Easter Egg Hunts Around Long Island"